Fun was spotted breaking out on the sometimes overly earnest New York jazz scene on Sunday, May 3. The outbreak’s ground zero was the historic Players Club in the Gramercy Park neighborhood of Manhattan. Let’s hope it spreads. On a beautiful Sunday in early spring, the Club-a historic gathering place for actors and literary figures since 1885-was the site of the annual New York Hot Jazz Festival, a one-day, 14-hour, marathon of traditional jazz, featuring 25 acts on three stages. The festival, now in its third year, has previously highlighted early jazz; this year it expanded to include 1930s and 1940s swing. A trio of young impresarios-Michael “Misha” Katsobashvili, Patrick Soluri and the 29-year-old Canadian trumpeter/singer Bria Skonberg-has turned the festival into a major event for a growing subculture of trad-jazz and swing musicians (many of them graduates of local jazz studies programs) and their fans, including a large contingent of twentysomethings. The 850 tickets for this year’s festival sold out in advance; the producers say they are already scouting out larger venues for next year’s edition. 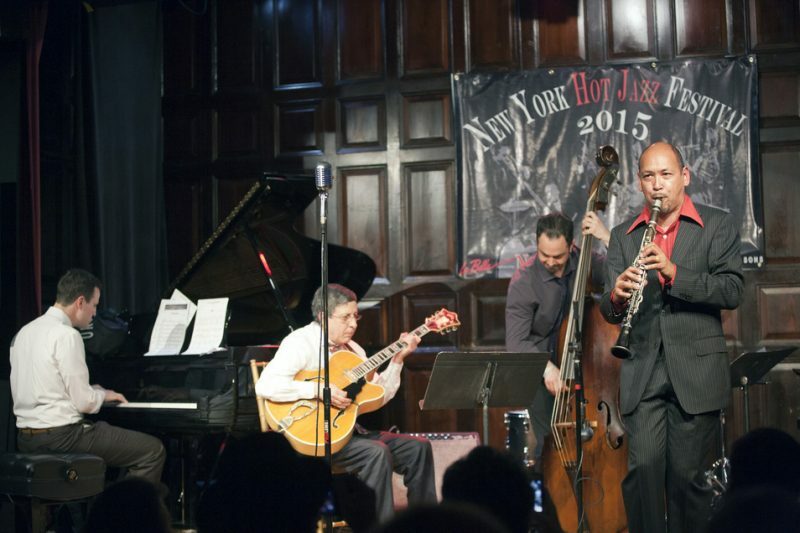 The music’s growing popularity represents a return to the roots of jazz as popular entertainment. Some fans came to swing-dance in vintage attire in the mansion’s ballroom; others sat cross-legged on the carpets in the mansion’s plush salons. They radiated enthusiasm for a style of jazz that, although it requires virtuosity of its players, doesn’t make similar demands on its listeners. An early highlight of the afternoon program was Nicki Parrott, a captivating Aussie bassist and vocalist. Performing in a trio with cornet champion Warren Vaché and swing guitarist Vinny Raniolo, her set attracted a standing-room-only crowd in the club’s second-floor library, including onlookers like pianist Bill Charlap and singer Rebecca Kilgore (both of whom performed sets later). Parrott’s sweet and simple vocals recalled Blossom Dearie, especially on “They Say It’s Spring,” a Dearie staple. She took a vigorous, tuneful bass solo on Cole Porter’s “You’d Be So Nice to Come Home To,” her dangly diamond earrings flying. Parrott, who used to play with Les Paul, studied with legendary bassist Rufus Reid, and it shows. One of the day’s pleasures was the chance to hear musicians who excel in more modern genres dig into vintage songs they might not normally play. One example was the inventive and virtuosic multi-reed player Scott Robinson, who went to town on oldies like “Back in Your Own Backyard,” Isham Jones’ “On the Alamo” and Irving Berlin’s “I’m Putting All My Eggs in One Basket.” Robinson performed as a member of Jon-Erik Kellso’s EarRegulars, alongside bassist Pat O’Leary and the excellent swing guitarist Matt Munisteri. Kellso, a memorable trumpet and cornet soloist with Catherine Russell’s band, is also a longstanding member of Vince Giordano and the Nighthawks. When Vaché joined the EarRegulars for several tunes, it made for a heavenly frontline. Two more exceptional units took the Ballroom stage to round out the afternoon: clarinetist/saxophonist Dan Levinson’s group, the Bix Millennium All-Stars; and Andy Farber and the After Midnight Orchestra. 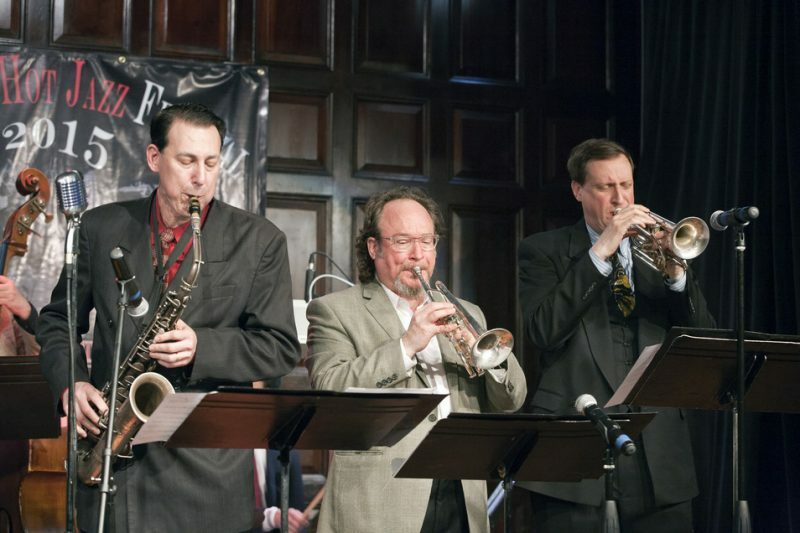 Levinson’s band, including Kellso and Mark Shane on piano, offered a selection of songs associated with Bix Beiderbecke in arrangements that hewed close to the originals. In “Singing the Blues”-a song Louis Armstrong refused to record, saying “It belonged to Bix”-Levinson sauntered through Frankie Trumbauer’s lilting alto solo, then presented Bix’s iconic cornet solo in crafty three-part harmony, with Kellso taking the lead. 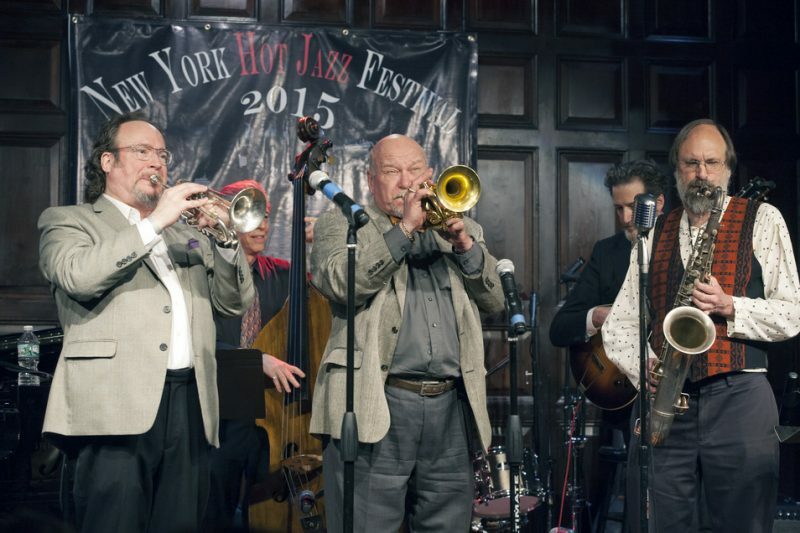 It’s hard to imagine a better swing orchestra in New York, or anywhere, than Farber’s crack 17-piece group, which was the onstage band for the 2013 Broadway hit celebrating the Cotton Club, After Midnight. The elegant singer Rebecca Kilgore, making one of her all-too-infrequent East Coast appearances, joined them; on songs like “I’m Confessin'” and “Just in Time,” she gave a mini-master-class in big-band singing. Meanwhile, a series of stride and swing pianists held forth in the parlor. Jon Weber subdued his monstrous chops to accompany the charming singer Margi Gianquinto, then let loose on a version of Gershwin’s “Swanee” that took off like the Coney Island Cyclone. A tough act to follow, but not for the continually astonishing Charlap, whose appearance was eagerly awaited by a small crowd of about 30 lucky folks who squeezed into the ornate room to hear him. Charlap, a once-in-a-generation player, embodies the whole history of jazz piano. Hearing him improvise, in several styles, on “‘S Wonderful,” one heard echoes of Gershwin’s own remarkable pianism. He played Joplin’s “The Entertainer” in two flavors-as written, then in a bluesy swing variation. All the while, Vaché, a rapt admirer, perched on a window ledge to look over the pianist’s left shoulder. And that was only the afternoon. The evening included hard-swinging sets by the vivacious Ms. Skonberg, with blues shouter Michael Mwenso; trombone master Wycliffe Gordon’s band; and retro sensations the Hot Sardines. 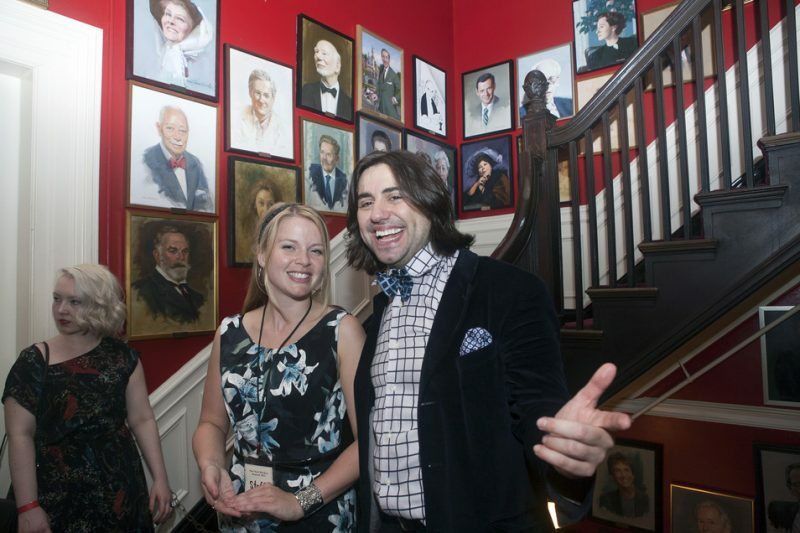 New Orleans clarinet virtuoso Evan Christopher was a standout. The very definition of the phrase “sweet and hot,” he displayed his beautiful tone and mastery of dynamics and drama. His set featured lovely, measured vocals by the winsome Hilary Gardner; dressed and coiffed for the occasion, she looked like she walked out of the pages of the Saturday Evening Post. Gardner sang a memorable version of Ellington’s “Azalea,” which marries the flavor of New Orleans to a modern, chromatic chord sequence. Like many of the tunes performed at the festival, it should be heard more often.